During his extended tenure working for the NYT, James Risen became a legend in the world of investigative and national security journalism: Risen broke some of the most important stories of the post 9/11 era, from the warrantless surveillance against Americans conducted under the Bush-Cheney administration, to black prison sites run by the CIA, to failed covert actions in Iran, stories for which Risen won the Pulitzer among other awards. But what Risen is perhaps most famous for, is fighting a battle under both the Bush and Obama administrations as they demanded — under threat of imprisonment —the name of one of Risen’s alleged confidential sources. In the end, Risen prevailed and refused to testify and he was not locked up. But during the course of his case, there were rulings that could have far reaching implications for journalists. But it isn’t just the government that Risen had to fight. He also battled his own editors and other powerful figures at the New York Times. Some of those people pushed the narrative that Iraq had WMDs and they regularly colluded with senior officials at the CIA, NSA, and White House in an effort to kill — or delay publication of — Risen’s stories. 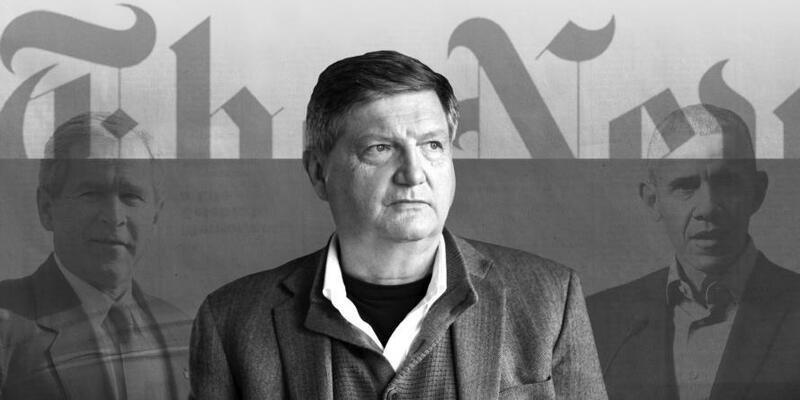 This morning, James Risen has written an extensive account of his years at the New York Times and he names names. Risen is now a senior national security correspondent at The Intercept where his incredible inside story has now been published. Below we present some excerpts from "My Life as a New York Times Reporter in the Shadow of the War on Terror"
As I walked past the photographers into the courthouse that morning in January 2015, I saw a group of reporters, some of whom I knew personally. They were here to cover my case, and now they were waiting and watching me. I felt isolated and alone. My lawyers and I took over a cramped conference room just outside the courtroom of U.S. District Judge Leonie Brinkema, where we waited for her to begin the pretrial hearing that would determine my fate. My lawyers had been working with me on this case for so many years that they now felt more like friends. We often engaged in gallows humor about what it was going to be like for me once I went to jail. But they had used all their skills to make sure that didn’t happen and had even managed to keep me out of a courtroom and away from any questioning by federal prosecutors. My case was part of a broader crackdown on reporters and whistleblowers that had begun during the presidency of George W. Bush and continued far more aggressively under the Obama administration, which had already prosecuted more leak cases than all previous administrations combined. Obama officials seemed determined to use criminal leak investigations to limit reporting on national security. But the crackdown on leaks only applied to low-level dissenters; top officials caught up in leak investigations, like former CIA Director David Petraeus, were still treated with kid gloves. Initially, I had succeeded in the courts, surprising many legal experts. In the U.S. District Court for the Eastern District of Virginia, Brinkema had sided with me when the government repeatedly subpoenaed me to testify before a grand jury. She had ruled in my favor again by quashing a trial subpoena in the case of Jeffrey Sterling, a former CIA officer who the government accused of being a source for the story about the ill-fated CIA operation. In her rulings, Brinkema determined that there was a “reporter’s privilege” — at least a limited one — under the First Amendment that gave journalists the right to protect their sources, much as clients and patients can shield their private communications with lawyers and doctors. But the Obama administration appealed her 2011 ruling quashing the trial subpoena, and in 2013, the 4th Circuit Court of Appeals, in a split decision, sided with the administration, ruling that there was no such thing as a reporter’s privilege. In 2014, the Supreme Court refused to hear my appeal, allowing the 4th Circuit ruling to stand. Now there was nothing legally stopping the Justice Department from forcing me to either reveal my sources or be jailed for contempt of court. But even as I was losing in the courts, I was gaining ground in the court of public opinion. My decision to go to the Supreme Court had captured the attention of the nation’s political and media classes. Instead of ignoring the case, as they had for years, the national media now framed it as a major constitutional battle over press freedom. That morning in Alexandria, my lawyers and I learned that the prosecutors were frustrated by my writing style. In “State of War: The Secret History of the CIA and the Bush Administration,” I didn’t include attribution for many passages. I didn’t explicitly say where I was getting my information, and I didn’t identify what information was classified and what wasn’t. That had been a conscious decision; I didn’t want to interrupt the narrative flow of the book with phrases explaining how I knew each fact, and I didn’t want to explicitly say how I had obtained so much sensitive information. If prosecutors couldn’t point to specific passages to prove I had relied on confidential sources who gave me classified information, their criminal case against Sterling might fall apart. When I walked into the courtroom that morning, I thought the prosecutors might demand that I publicly identify specific passages in my book where I had relied on classified information and confidential sources. If I didn’t comply, they could ask the judge to hold me in contempt and send me to jail. I was worried, but I felt certain that the hearing would somehow complete the long, strange arc I had been living as a national security investigative reporter for the past 20 years. As I took the stand, I thought about how I had ended up here, how much press freedom had been lost, and how drastically the job of national security reporting had changed in the post-9/11 era. I was the first reporter many of them had ever met. As they emerged from their insular lives at the CIA, they had little concept of what information would be considered newsworthy. So I decided to show more patience with sources than I ever had before. I had to learn to listen and let them talk about whatever interested them. They had fascinating stories to tell. In addition to their experiences in spy operations, many had been involved in providing intelligence support at presidential summit meetings, treaty negotiations, and other official international conferences. I realized that these former CIA officers had been backstage at some of the most historic events over the last few decades and thus had a unique and hidden perspective on what had happened behind the scenes in American foreign policy. I began to think of these CIA officers like the title characters in Tom Stoppard’s play “Rosencrantz and Guildenstern Are Dead,” in which Stoppard reimagines “Hamlet” from the viewpoint of two minor characters who fatalistically watch Shakespeare’s play from the wings. While covering the CIA for the Los Angeles Times and later the New York Times, I found that patiently listening to my sources paid off in unexpected ways. During one interview, a source was droning on about a minor bureaucratic battle inside the CIA when he briefly referred to how then-President Bill Clinton had secretly given the green light to Iran to covertly ship arms to Bosnian Muslims during the Balkan wars. The man had already resumed talking about his bureaucratic turf war when I realized what he had just said and interrupted him, demanding that he go back to Iran. That led me to write a series of stories that prompted the House of Representatives to create a special select committee to investigate the covert Iran-Bosnia arms pipeline. Another source surprised me by volunteering a copy of the CIA’s secret history of the agency’s involvement in the 1953 coup in Iran. Up until then, the CIA had insisted that many of the agency’s internal documents from the coup had long since been lost or destroyed. But one incident left me questioning whether I should continue as a national security reporter. In 2000, John Millis, a former CIA officer who had become staff director of the House Intelligence Committee, summoned me to his small office on Capitol Hill. After he closed the door, he took out a classified report by the CIA’s inspector general and read it aloud, slowly, as I sat next to him. He repeated passages when I asked, allowing me to transcribe the report verbatim. The report concluded that top CIA officials had impeded an internal investigation into evidence that former CIA Director John Deutch had mishandled large volumes of classified material, placing it on personal computers in his home. The story was explosive, and it angered top CIA officials. In hindsight, I believe the criticism was valid. That bitter experience almost led me to leave the Times. Instead, I decided to stay. In the end, it made me much more skeptical of the government. Then-Executive Editor Howell Raines was believed by many at the paper to prefer stories that supported the case for war. But Raines now says he was not pro-war, and that he did not object to putting my Prague story on the front page. “I never told anyone at any level on the Times that I wanted stories that supported the war,” he told me in an email. Meanwhile, Judy Miller, an intense reporter who was based in New York but had sources at the highest levels of the Bush administration, was writing story after story that seemed to document the existence of Iraq’s weapons of mass destruction. Her stories were helping to set the political agenda in Washington. Miller and I were friends — in fact, I was probably one of her closest friends in the Washington bureau at the time. In the year before 9/11, Miller worked on a remarkable series of stories about Al Qaeda that offered clear warnings about its new power and intent. In the months after 9/11, she and I both scrambled to document Al Qaeda’s role in the attacks and the counterterrorism response by the United States. We were both part of a team that won the 2002 Pulitzer Prize for Explanatory Reporting for our coverage of terrorism and 9/11. But in the months leading up to the March 2003 invasion of Iraq, while Miller and other Times reporters were landing a string of big stories that dazzled the editors, I was getting frustrated that so few of my sources in the intelligence community were willing to talk to me about what they thought of the Bush administration’s case for war. I kept hearing quiet complaints that the White House was pressuring CIA analysts to cook the books and deliver intelligence reports that followed the party line on Iraq. But when I pressed, few were willing to provide specifics. Intermediaries would sometimes tell me that they were receiving anguished calls from CIA analysts, but when I asked to talk to them, they refused. Just as the invasion of Iraq was about to get underway, I started working on an intriguing story that helped take my mind off my battles with the Times over pre-war intelligence. I have to admit, it was strange doing an interview naked, but that’s what a key source demanded. In March 2003, I flew to Dubai to interview a very nervous man. It had taken weeks of negotiations, through a series of intermediaries, to arrange our meeting. We agreed on a luxury hotel in Dubai, the modern capital of Middle Eastern intrigue. Just before we were scheduled to meet, however, the source imposed new demands. We would have to talk in the hotel’s steam room, naked. He wanted to make sure he wasn’t being recorded. That also made it impossible for me to take notes until after our meeting. But it was worth it. He told me the story of how Qatar had given sanctuary to Khalid Shaikh Mohammed in the 1990s, when he was wanted in connection with a plot to blow up American airliners. Qatari officials had given KSM a government job and then had apparently warned him when the FBI and CIA were closing in, allowing him to escape to Afghanistan, where he joined forces with bin Laden and became the mastermind behind the 9/11 plot. I was later able to confirm the story, which was especially significant because Qatar was home to the forward headquarters of U.S. Central Command, the military command in charge of the invasion of Iraq. After the story ran, I felt revitalized. That spring, just as the U.S.-led invasion of Iraq began, I called the CIA for comment on a story about a harebrained CIA operation to turn over nuclear blueprints to Iran. The idea was that the CIA would give the Iranians flawed blueprints, and Tehran would use them to build a bomb that would turn out to be a dud. The problem was with the execution of the secret plan. The CIA had taken Russian nuclear blueprints it had obtained from a defector and then had American scientists riddle them with flaws. The CIA then asked another Russian to approach the Iranians. He was supposed to pretend to be trying to sell the documents to the highest bidder. But the design flaws in the blueprints were obvious. The Russian who was supposed to hand them over feared that the Iranians would quickly recognize the errors, and that he would be in trouble. To protect himself when he dropped off the documents at an Iranian mission in Vienna, he included a letter warning that the designs had problems. So the Iranians received the nuclear blueprints and were also warned to look for the embedded flaws. Several CIA officials believed that the operation had either been mismanaged or at least failed to achieve its goals. By May 2003, I confirmed the story through a number of sources, wrote up a draft, and called the CIA public affairs office for comment. Instead of responding to me, the White House immediately called Washington Bureau Chief Jill Abramson and demanded a meeting. The next day, Abramson and I went to the West Wing of the White House to meet with National Security Adviser Condoleezza Rice. In her office, just down the hall from the Oval Office, we sat across from Rice and George Tenet, the CIA director, along with two of their aides. Rice stared straight at me. I had received information so sensitive that I had an obligation to forget about the story, destroy my notes, and never make another phone call to discuss the matter with anyone, she said. She told Abramson and me that the New York Times should never publish the story. I tried to turn the tables. I asked Tenet a few questions about the Iranian program and got him to confirm the story, and also provide some details I hadn’t heard before. The only point he disputed was that the operation had been mismanaged. Abramson told Rice and Tenet that the decision on whether to run the story was up to Times Executive Editor Howell Raines. After the meeting, Abramson and I stopped for lunch. We were both stunned by the full-court press we had just endured. But I also recognized that I had just gotten high-level confirmation for the story — better confirmation than I could ever have imagined. Just after Abramson and I met with Tenet and Rice, the Jayson Blair scandal erupted, forcing Raines into an intense battle to save his job. Blair may have been the immediate cause of the crisis, but among the staff at the Times, Blair was merely the trigger that allowed resentment that had built up against Raines over his management style to come out into the open. Raines left the paper in early June 2003. Joe Lelyveld, the retired executive editor, briefly came back to run the Times on an interim basis. I talked to him by phone about the Iran story, but he didn’t really have time to deal with it. When Bill Keller was named executive editor in the summer of 2003, he agreed to discuss the story with Abramson and me. Abramson, meanwhile, had been promoted to managing editor, Keller’s No. 2. After I went over the story with him, Keller decided not to publish it. I tried over the next year to get him to change his mind, but I couldn’t. The spiking of the Iran story, coming so soon after the internal fights over WMD coverage, left me depressed. I began to think about whether to write a book that would include the Iran story and document the war on terror more broadly in a way I didn’t believe I had been able to do in the Times. The Bush administration was successfully convincing the press to hold or kill national security stories, but the government had not yet launched an aggressive campaign to hunt down whistleblowers and target reporters. That all changed with the Valerie Plame case. In December 2003, the Justice Department appointed Patrick Fitzgerald, then the U.S. attorney in Chicago, to be a special counsel to investigate allegations that top Bush White House officials had illegally leaked Plame’s covert identity as a CIA officer. Critics claimed that the Bush White House had sold her out to the press as retribution against her Iraq war critic husband, former U.S. diplomat Joseph Wilson. Without thinking about the long-term consequences, many in the media cheered Fitzgerald on, urging him to aggressively go after top Bush administration officials to find out who was the source of the leak. Anti-Bush liberals saw the Plame case and the Fitzgerald leak investigation as a proxy fight over the war in Iraq, rather than as a potential threat to press freedom. Fitzgerald, an Inspector Javert-like prosecutor whose special counsel status meant that no one at the Justice Department could rein him in, started subpoenaing reporters all over Washington and demanding they testify before a grand jury. Fitzgerald became famous as a tough, no-nonsense prosecutor, and the fact that he had run roughshod over the Washington press corps didn’t hurt his reputation. He went on to become a partner in one of America’s premier law firms. The Plame case eventually faded away, but it had set a dangerous precedent. Fitzgerald had successfully subpoenaed reporters and forced them to testify and in the process, had become the Justice Department’s biggest star. He had demolished the political, social, and legal constraints that previously made government officials reluctant to go after journalists and their sources. He became a role model for career prosecutors, who saw that you could rise to the top of the Justice Department by going after reporters and their sources. White House officials, meanwhile, saw that there wasn’t as much political blowback from targeting reporters and conducting aggressive leak investigations as they had expected. The decadesold informal understanding between the government and the press — that the government would only go through the motions on leak investigations — was dead. In the summer of 2003, the New York Times named a new Washington bureau chief: Philip Taubman, an old friend of Bill Keller’s. Taubman had been the Times’s Moscow bureau chief when Keller won a Pulitzer Prize as a correspondent there. Now Taubman was Keller’s man in Washington. Taubman and I developed a friendly relationship. He had covered national security and intelligence matters earlier in his career, and he seemed eager for scoops. But by 2004, I began to disagree with some of his decisions. That spring, I learned that the Bush administration had discovered that Ahmad Chalabi, the neoconservatives’ golden boy in Iraq, had told an Iranian intelligence official that the National Security Agency had broken Iranian codes. That was a huge betrayal by the man some senior Bush administration officials had once considered installing as the leader of Iraq. But after I called the CIA and NSA for comment, NSA Director Michael Hayden called Taubman and asked him not to run the story. Hayden argued that even though Chalabi had told the Iranians that the U.S. had broken their codes, it wasn’t clear the Iranians believed him, and they were still using the same communications systems. Taubman agreed, and we sat on the story until the CIA public affairs office called and told him that someone else was reporting it, and that we should no longer feel bound not to publish. I was upset that I had lost an exclusive, and I believed that Hayden’s arguments against publication had been designed simply to save the White House from embarrassment over Chalabi. In the spring of 2004, just as the Plame case was heating up and starting to change the dynamics between the government and the press, I met with a source who told me cryptically that there was something really big and really secret going on inside the government. It was the biggest secret the source had ever heard. But it was something the source was too nervous to discuss with me. A new fear of aggressive leak investigations was filtering down. I decided to stay in touch with the source and raise the issue again. Over the next few months, I met with the source repeatedly, but the person never seemed willing to divulge what the two of us had begun to refer to as “the biggest secret.” Finally, in the late summer of 2004, as I was leaving a meeting with the source, I said I had to know what the secret was. Suddenly, as we were standing at the source’s front door, everything spilled out. Over the course of about 10 minutes, the source provided a detailed outline of the NSA’s massive post-9/11 domestic spying program, which I later learned was code-named Stellar Wind. The source told me that the NSA had been wiretapping Americans without search warrants, without court approval. The NSA was also collecting the phone and email records of millions of Americans. The operation had been authorized by the president. The Bush administration was engaged in a massive domestic spying program that was probably illegal and unconstitutional, and only a handful of carefully selected people in the government knew about it. I left that meeting shocked, but as a reporter, I was also elated. I knew that this was the story of a lifetime. The NSA had lived by strict rules against domestic spying for 30 years, ever since the Church Committee investigations of intelligence abuses in the 1970s had led to a series of reforms. One reform measure, the Foreign Intelligence Surveillance Act of 1978, made it illegal for the NSA to eavesdrop on Americans without the approval of a secret FISA court. My source had just revealed to me that the Bush administration was secretly ignoring the law requiring search warrants from the FISA court. I quickly began to think about how I could confirm the story and fortunately found the right person, a source who didn’t usually like to volunteer much information but was sometimes willing to confirm things I had heard elsewhere. As we sat alone in a quiet bar, I told the source what I had heard about the NSA program, and it was immediately clear that the source knew the same secret and was troubled by it. The source explained many of the technical details of the Bush administration’s secret NSA domestic spying program to me, describing how the NSA had latched onto giant gateway switches along the borders between the domestic and international telecommunications networks, so it could vacuum up all international phone traffic and email messages sent or received by Americans. As I worked to find more people to talk to about the story, I realized that the reporter sitting next to me in the Washington bureau, Eric Lichtblau, was hearing similar things. Lichtblau covered the Justice Department. When he first came to the paper in 2002, I had been jealous of his abilities as a reporter, especially his success at developing sources. I sometimes let my resentment get the better of me; I recall one meeting with Abramson in which I was openly dismissive of an exclusive story Lichtblau was working on. But he never held it against me, and we struck up a friendship and started working on stories together. Lichtblau had heard from a source that something potentially illegal was going on at DOJ, that officials seemed to be ignoring the law requiring warrants for national security wiretaps, and that Attorney General John Ashcroft might be involved. Lichtblau and I compared notes, and we realized we were probably hearing about the same story. We decided to work together. We both kept digging, talking to more people. We started doing some interviews together and discovered that we had very different reporting styles. While I liked to let a source talk about whatever was on their mind, Lichtblau liked to get right to the point, and sometimes badgered sources to cough up information. Our approaches were complementary, and we inadvertently developed a good cop-bad cop routine. Lichtblau would often give our sources colorful nicknames, which made it easier for us to talk without revealing their identities. He called one early source on the NSA story “Vomit Guy” because when he told the source what he wanted to talk about, the source told Lichtblau he was so upset about the topic that he wanted to throw up. By the fall of 2004, we had a draft of a story. I felt it was time to go through the front door, so I decided on impulse to try to bluff my way to the top of the NSA. I called the NSA’s press spokesperson, Judy Emmel, and told her I had to talk to Hayden immediately. I said it was urgent, and I couldn’t tell her what it was about. She got Hayden on the phone right away. I was shocked that my bluff had worked, but now that I had Hayden, I had to think fast about what I wanted to ask him. I decided to read him the first few paragraphs of the draft Lichtblau and I were writing. Lichtblau was sitting next to me, staring intently as I read Hayden the top of the story on the phone. I was sitting in front of my computer, ready to transcribe whatever Hayden would say. After I read the first few paragraphs, Hayden let out an audible gasp and then stammered for a moment. Finally, he said that whatever the NSA was doing was legal and operationally effective. I pressed him further, but he refused to say more and hung up. Hayden had all but confirmed the story. It seemed obvious from his response that he knew exactly what I was talking about and had begun to defend his actions before deciding to end the conversation. After explaining to Lichtblau what Hayden had just said, I walked over to Taubman’s office to tell him the news. “I thought it was a terrific scoop, but knew we would be faced with some tough questions about whether publication might undermine U.S. efforts to prevent another 9/11 style attack,” Taubman emailed me recently. Within days, Hayden called Taubman and asked him not to run the NSA story. Taubman listened, but was noncommittal. That was the beginning of what turned out to be more than a year of negotiations between the Times and the Bush administration, as officials repeatedly sought to kill the NSA story. A few days later, Taubman and I went to the Old Executive Office Building, next to the White House, to meet with acting CIA Director John McLaughlin, who had recently replaced Tenet, and McLaughlin’s chief of staff, John Moseman. We met them in the office the CIA director maintains in the OEB to be close to the White House. The meeting, the first of many between the Times and the government over the NSA story, was odd. In contrast to my meeting with Tenet and Rice on the Iran story, when they had confirmed the story while asking the paper to kill it, McLaughlin and Moseman refused to acknowledge that the NSA story was true, even as they asked us not to print it. They kept speaking in hypothetical terms, saying that if such a program existed, it would be important to the United States that it remain secret, and American newspapers shouldn’t report on such things. I had now been through this routine with the Bush administration several times, and their dire warnings about national security no longer impressed me. They had cried wolf too many times to be credible. Taubman didn’t give them an answer about whether the Times would publish the story, telling them it would be up to Keller. He also demanded that they warn us if they found out any other news organization was onto the same story. As Lichtblau and I continued to report, we realized that we had to get a better understanding of how American and international telecommunications networks worked. I spent a day in the library at Georgetown University, poring over technical journals and academic works on the telecommunications industry. I called AT&T’s headquarters and told the company’s spokesperson I was interested in learning more about the infrastructure of the telephone system, particularly the big switches that brought telephone and internet traffic into the United States. I did not tell the spokesperson why I was taking an interest in such an arcane issue, other than that it was for a story in the New York Times. At first, the spokesperson was very friendly and cooperative, and said he would be happy to have me talk with some of AT&T’s technical experts, adding that he might be able to arrange a tour of their facilities. But I never heard from him again. I called back several times, but he didn’t return my calls. I finally figured that someone from the Bush administration had admonished AT&T not to talk to me. During October 2004, Lichtblau and I kept reporting and writing. We sometimes wrote at my house outside Washington, taking breaks to watch the epic baseball playoffs between the Boston Red Sox and New York Yankees. Rebecca Corbett, our editor in the Washington bureau, had been working with us on the story. We were operating against the backdrop of the 2004 presidential race between George W. Bush and John Kerry. With a week or two to go before the election, Lichtblau and I, along with Corbett and Taubman, went to New York for a meeting with Keller and Abramson to decide whether the story would be published. We sat in the back alcove of Keller’s office in the old Times building on 43rd Street. It was a comfortable, book-lined nook that I had visited once before, when I had tried to get Keller to change his mind and publish the long-spiked CIA-Iran story. Lichtblau, Corbett, and I argued strongly that the NSA story should be published. In that small room, we launched into an intense debate over whether to publish the story, dominated by the inherent tension between national security and the public’s right to know. A key issue was the legality of the NSA program. Keller seemed skeptical of our sources’ arguments that the program was illegal and possibly unconstitutional. There were some tense exchanges. As the meeting wore on and Keller was unconvinced by each reason we gave for running the story, I grew more desperate to find some argument that might change his mind. Finally, I said that if we didn’t run the story before the election, a key source might go elsewhere and another news outlet might publish it. That was exactly the wrong thing to say to Keller. He got his back up, wondering aloud whether the source had a political agenda. He said he wouldn’t be pressured into running the story before the election because he didn’t want to let the potential political impact affect his journalistic decision. I pointed out that if he decided not to run the story before the election, that would also have an impact, but he seemed to ignore my comment. Keller’s rejection was a setback. But after the election, Lichtblau and I convinced the editors to let us start working on the story again. As we looked for more sources, we began to feel the chilling effect of the government’s new approach to leak investigations. Within the small group of people in the government who knew about the NSA program, many also knew by now that we were investigating it and were afraid to talk to us. On a snowy night in December 2004, we drove to the home of one official who Lichtblau believed knew about the NSA program. When the official opened the door, he recognized Lichtblau and quickly realized why we were there. He started berating us for showing up unannounced, told us to leave immediately, and shut the door. He seemed worried that someone might have seen us outside his house. The paper once again began meetings with top administration officials who wanted to stop us from running the story. In the weeks after the election, Lichtblau, Taubman, and I went to the Justice Department to meet with Deputy Attorney General James Comey and White House Counsel Alberto Gonzales. Ashcroft had just resigned, and while it had not yet been announced, it was clear that Gonzales was about to replace him as attorney general. Now it was up to Gonzales to convince us to kill the story. Meanwhile, the White House decided to enlist members of the “Gang of Eight,” the handful of congressional leaders who had been secretly briefed on the program while the rest of Congress was kept in the dark. Then-Rep. Jane Harman, the ranking Democrat on the House Intelligence Committee, called Taubman and made the case that the New York Times should not run the story. By mid-December 2004, the story had been re-reported, so Lichtblau, Corbett, and I began pushing again to get it into the paper. Instead of traveling to New York this time, we held a series of closed-door meetings with Taubman in his office in Washington. The additional reporting and rewriting did not sway him. He accepted the Bush administration’s arguments that the piece would harm national security. He killed the story. This time, Keller was not directly involved in our meetings. The NSA story now seemed permanently dead. I was about to start a long-scheduled leave to write a book about the CIA and the Bush administration. I was furious that the Times had killed both the Iran and the NSA stories, and angry that the White House was successfully suppressing the truth. I told myself that if I kept going along with decisions to cut, bury, or outright kill so many stories, as I had the last few years, I wouldn’t be able to respect myself. I decided to put the Iran and the NSA stories in my book. I was pretty sure that meant I would be fired from the Times. It was nerve-wracking, but my wife, Penny, stood firm. “I won’t respect you if you don’t do it,” she told me. That sealed my decision. Throughout early 2005, I worked at home on “State of War,” which was scheduled to be published by Free Press, an imprint of Simon and Schuster, in early 2006. After I wrote the chapter about the NSA domestic spying program, I called Lichtblau and asked him to come to my house. When he arrived, I told him to sit down, read the chapter, and let me know whether it was OK to put the story in my book. After he finished reading, he joked that I had buried the lede, but I sharply reminded him that writing a book was different from writing a news story. He gave his approval to include it in the book, since he knew the story was dead at the Times. He only asked that I mention him by name in the chapter — and spell his name correctly. I returned from book leave in May 2005 and finished my manuscript later that summer. In the late summer or early fall, after I turned in the last chapters to my publisher and the editing process at Free Press was virtually complete, I decided to let the Times know what I was doing. I emailed Jill Abramson, who by then was in New York, and told her that I was putting the NSA and the Iran stories in my book. The reaction was swift. Within minutes, Taubman was standing near my desk, grimly demanding to talk. We went into his office. He said firmly that I was being insubordinate and rebelling against the editorial decisions of the Times. Taubman also recalls that he was angry because he believed I had misled him before I went on book leave into thinking I was going to write a biography of George Tenet. He’s probably right. He wanted me to take the NSA story out of my book. I responded that I wanted the NSA story to be published both in the Times and in my book. We began to talk almost every day about how to resolve our impasse. Initially, I suggested the paper run the NSA story when my book came out, under the kind of arrangement that the Washington Post seemed to have with Bob Woodward. The Post regularly excerpted Woodward’s books on its front page, giving the paper Woodward’s scoops and his books enormous publicity. That proposal went nowhere. Eventually, Taubman countered that the paper would only consider running the NSA story if I first agreed to remove it from my book and thus, give the paper the chance to reconsider its publication without any undue pressure. But I knew the only reason the Times would even consider running the NSA story was if I kept it in my book. Besides Eric Lichtblau, the Times’s top editors, and me, only a few people at the paper knew about the NSA story or the intense debate underway over whether to publish it. Lichtblau and I would sometimes walk around nearby Farragut Square when we wanted to speak in confidence. In front of most other reporters and editors in the office, I tried to act as if nothing unusual was going on, but I’m sure a few suspected something was up. That fall, I became so concerned that the Times would not run the NSA story and that I would be fired that I secretly met with another national news organization about a job. I told a senior editor there that I had a major story that the Times had refused to run under pressure from the White House. I didn’t tell him anything about the story, but I said if they hired me, I would give the story to them. The senior editor replied that their publication would never run a piece if the White House raised objections on national security grounds. I left that meeting more depressed than ever. After a long series of contentious conversations stretching over several weeks in the fall of 2005, I finally reached an uneasy compromise with the editors. They would let Lichtblau and me start working on the NSA story again, and the paper would resume talks with the Bush administration over whether to publish it. But if the paper once again decided not to run the story, I had to take it out of my book. I agreed to those conditions, but I secretly knew that it was already too late to take the chapter out of my book, and I had no intention of doing so. I was gambling that the Times would run the story before the book was published. But I also knew that if the editors didn’t run it, I would probably be out of a job. The editors began a new round of meetings with Bush administration officials, who were apparently surprised that the Times was resurrecting the NSA story. I was excluded from these conversations. In each of the meetings in which they sought to convince the editors not to run the story, Bush administration officials repeatedly said the NSA program was the crown jewel of the nation’s counterterrorism programs, and that it saved American lives by stopping terrorist attacks. The meetings dragged on through the fall of 2005. Michael Hayden, now the principal deputy director of the Office of National Intelligence, often took the lead, and continued to meet with Philip Taubman. In one meeting, Taubman and Bill Keller received a secret briefing in which officials described the counterterrorism successes of the program. But when the two editors returned to the Washington bureau, they told Lichtblau and me that their briefing was off the record and so secret that they couldn’t share what they’d heard. Lichtblau and I eventually realized that Bush administration officials had been misleading Keller and Taubman. The officials had told them that under the NSA’s secret domestic spying program, the agency didn’t actually listen to any phone calls or read any emails without court-approved search warrants. They had insisted that the agency was only vacuuming up metadata, obtaining phone calling logs and email addresses. The content of the phone calls and email messages was not being monitored, the officials had told the editors. That was not true, but the government had been trying to convince Keller and Taubman that Lichtblau and I had been exaggerating the scope of the story. It took time, but Lichtblau and I were finally able to persuade Keller and Taubman that they had been misled. In our recent interview, Keller said that once he realized the administration had been disingenuous with him, he started to change his mind about publishing the story. It was also critically important that Lichtblau had developed a new source who said that some Bush administration officials had expressed fears that they might face prosecution for their involvement in the secret NSA spying operation. There had also been an intense debate at the highest levels of the Bush administration about the legality of some aspects of the program. That raised fundamental questions about the reassurances the Times editors had received from administration officials about the program’s standing. In the late fall of 2005, I also got an important lead from a new source, but the tip was so cryptic I didn’t know what to make of it at the time. It came when a senior official agreed to see me, but only on the condition that our interview be conducted with other officials present. During that meeting, the official repeatedly and loudly expressed total ignorance of any secret NSA domestic spying program. Lichtblau and I struggled for weeks to figure out what that tip meant. By late November 2005, Keller seemed to be leaning toward publishing the NSA story, but the editors were moving so slowly that I was getting nervous that they wouldn’t make up their minds before my book came out in January. I was more anxious than I had ever been in my life. I couldn’t sleep and began to develop high blood pressure. I tried to distract myself by going to the movies, but I was so stressed that I would usually walk out after five or 10 minutes. I also had to keep meeting with key sources on the NSA story to persuade them to stick with me and not take the story elsewhere. I urged them to be patient, though I was running out of patience myself. During meetings on the NSA story with Lichtblau and Rebecca Corbett, I was so fatigued and stressed that I would often lie down and shut my eyes on the couch in Corbett’s office. With the clock ticking and the publication of my book looming, Taubman asked me to arrange a new round of meetings with the very few Democratic congressional leaders who knew about the NSA program. He wanted them to tell him that it was OK to run the story. Both Lichtblau and I found this request troubling. Then, after one final round of meetings with the White House in early December, Keller said he had decided to run the story. He called the White House and told them his decision. President Bush then called Arthur Sulzberger, the Times’s publisher, and asked for a personal meeting and a chance to convince Sulzberger to overrule Keller. It was intimidating stuff, but I was confident that Sulzberger would view this as a chance to live up to the legacy of his father, who had published the Pentagon Papers in the face of threats from the Nixon White House. Sulzberger, Keller, and Taubman went to the Oval Office to meet Bush. Lichtblau and I were not invited to the meeting and were not even allowed to meet with Sulzberger to brief him on the story beforehand. Keller later said that Bush told Sulzberger he would have “blood on your hands” if he published the NSA story. Keller also said the meeting didn’t change his or Sulzberger’s minds about publishing the story. Keller and the other editors began to express confidence that the story would run, yet there was still no date for publication. In fact, the White House was trying to schedule more meetings with the editors to try one last time to change their minds. I was frantic; it was December, my book was coming out in early January, and the story still hadn’t run in the Times. Finally, Lichtblau came in with new information that prompted the Times to publish the story. Just days after the Bush-Sulzberger Oval Office meeting, a source told Lichtblau that the White House had considered getting a court-ordered injunction to prevent the Times from publishing the story. This was electric news, because the last time that had happened at the Times was during the Pentagon Papers case in the 1970s, one of the most important events in the history of the newspaper. The debate about whether to run the story was over. By that afternoon, the piece was ready to go. We had one advantage over the Times of the early 1970s during the Pentagon Papers crisis, and that was the internet. It would be much more difficult for the White House to go to court to stop publication because we could quickly put the story online. So soon after Keller called the White House to tell them the story was running, the NSA story was posted on the New York Times website. It ran on the front page on December 16, 2005. Lichtblau, Corbett, Taubman, and I sat in Taubman’s office, listening over a speaker phone as Keller made the final decision to post the story. As the call with Keller ended, I let out a long sigh. Taubman looked at me. “What’s wrong?” he asked. Today, Keller defends his handling of the NSA story — both in 2004 and in 2005 — and reflects that one factor was the changing climate in the country, which had soured on Bush, the war in Iraq, and the war on terror. “I’m pretty comfortable both with the decision not to publish and the decision to publish,” he told me recently. I didn’t care about the lack of a banner headline. My game of chicken with the Times was over, and I felt like I had won.